Tough and comfortable, 5.11 EVO CST Boots deliver superior protection and traction for any terrain. The puncture-resistant frame and composite safety toe guard against the elements, while the cemented and stitched EVO Cupsole, full-length EVA midsole, and a nylon shank provide absolute durability and stability. A 14mm heel-to-toe drop ensures a responsive stance, and an Ortholite insole and stroble sock enhance comfort. 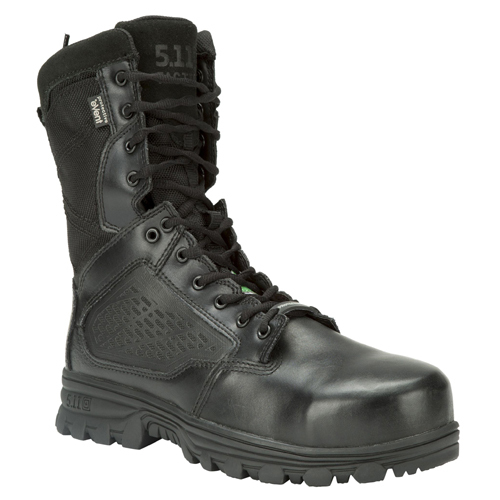 Featuring a full-grain leather upper, non-metallic construction, and side-zip access. Stay safe and be ready.